Salt Lake has never been shy about being a destination for religious tourism. Temple Square, at the heart of the city, boasts millions of visitors annually, drawing both saints and sinners to bask in the beauty of its ten acres of manicured gardens, Tabernacle, and visitor’s center. However, Mormons don’t hold the monopoly on beautiful (and occasionally weird) religious art and architecture in the salty city. If you’re making your way east on South Temple, you can’t miss the three-story, Egyptian-style building flanked by two sphinx. The Salt Lake Masonic Temple was completed in 1927, after years of planning by the Masonic community. Given the Masonic practice of keeping rites and symbols secret, finishing construction was no easy feat. Beyond the arduous task of creating a beautiful piece of architecture, the architect had to find ways to obscure numerous aspects of the building that were of sacred importance to the Masons. The Egyptian style of the building helps conceal the symbols in plain sight, though the architect notes that in the construction process many elements were not included in the plans and instructions were given by word of mouth to draughtsmen and construction workers so as not reveal anything to the uninitiated. The decor in the three-story building is distinct, to say the least. Styles range from Colonial American (designed to be reminiscent of George Washington’s home), to Moorish and Egyptian. A particular highlight is the 900-seat auditorium that features a terrestrial dome that can represent dawn through Utah’s night sky—complete with area-appropriate constellations (not just random Big Dippers), depending on the lighting. It’s an amazing venue for both religious practice and local cultural performances. The temple welcomes visitors with advanced notice for tours. The space is also leased out for a variety of public events, including flea markets and concerts that provide the opportunity for an informal wander. The guided tour is recommended, given the historical and religious context that docents can provide. Arrange a tour by calling 801-363-2550. Also located on South Temple is Salt Lake City’s Cathedral of the Madeleine. Under the patronage of St. Mary Magdalene, Salt Lake City’s Cathedral is a stunning neo-Romanesque piece of architecture, built from Utah sandstone, with a beautiful copper roof. The Cathedral is open seven days a week for various services, though you can take a public tour on Tuesday afternoons if mass isn’t your thing (please call ahead: 801-328-8941). 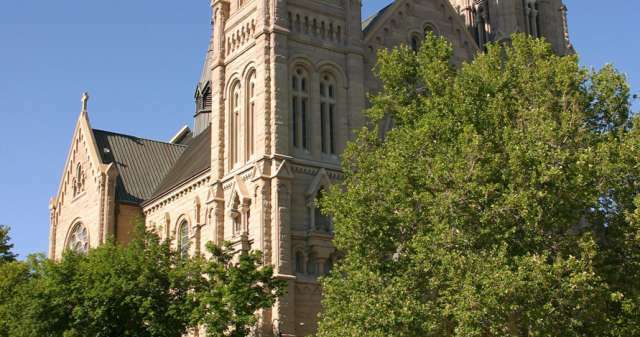 The Cathedral regularly hosts musical performances, providing the opportunity to hear world-class performers (seriously, check out the Madeleine Choir School and the Utah Chamber Artists) in this stunning piece of Salt Lake City architecture. The Cathedral of the Madeleine was completed after a decade of construction in 1909, and renovated in the early 1990s to enhance and strengthen the structure. Its interior’s ornate Neo-Gothic style is so beautiful it makes sense that people would visit to seek the Divine. The Stations of the Cross were crafted by Utah artist Roger Wilson, and depict Jesus Christ on the day of his crucifixion. Wilson’s pieces combine traditional iconography with American Southwestern color and postmodern style. The Cathedral’s organ is massive—with 4,066 pipes and ornate woodwork. Above the organ is the Rose Window glass piece of St. Cecilia, patroness of music. Another breathtaking piece features the Cathedral’s patron saint, St. Mary Magdalene, washing the feet of Jesus Christ. These elements barely scrape the surface in terms of the artistic and architectural offerings in the building. Take a guided tour of the Cathedral to get up close and personal with one of Utah’s most cherished pieces of architecture, and learn more about the catholic church’s history in the state. The garden features 12 substantial rock sculptures and over 70 inscribed stones, all constructed from raw Utah materials, on site in Child’s backyard workspace. The massive stone sculptures include a giant arch (part of The Monument to the Priesthood), a self-portrait many lovingly call “Brick Pants” (The Monument to the Trade), and a Joseph Smith Sphinx, which is exactly what it sounds like. It’s incredible. Gilgal is now officially a Salt Lake City public park, and open dawn to dusk every day. There are few places as quiet and weird in the middle of the city to take a picnic lunch. It’s also a great location for family photos—just don’t let your kids climb all over the pieces (they’ll want to). 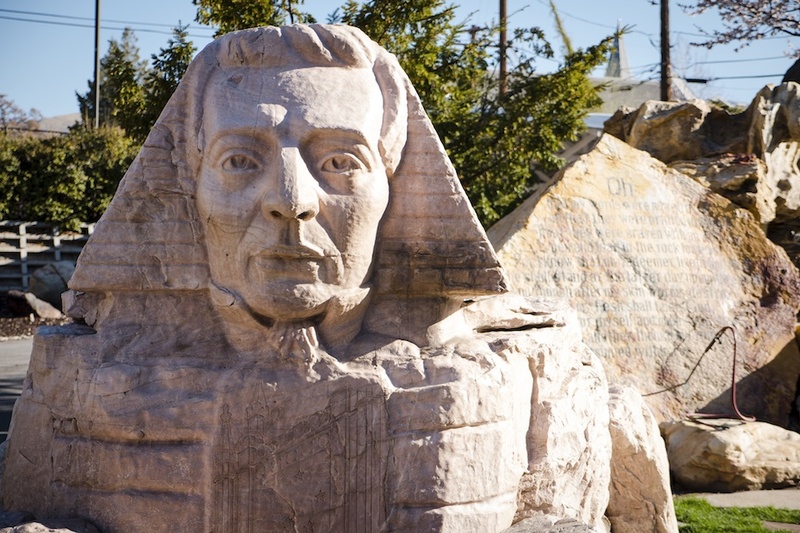 Pamphlets are available on site for self-guided tours, and the website provides a rich backstory for all the sculptures in this Salt Lake City treasure. Though it may not feature the ornate handiwork of some other religious buildings in Salt Lake City, a visit to the Summum Pyramid is worthwhile as it marks a twentieth-century endeavor into creating an alternate spiritual space. Completed in 1979, the pyramid serves as a sanctuary for those who follow the path of Summum, founded in 1975 by Amen Ra (nee, Claude “Corky” Rex Nowell). While Gilgal Gardens is a meditative work from a Mormon believer, Summum is a divergence from the faith—Ra was raised a Latter-Day Saint and left to start his own religion. In 1980, Ra introduced the practice of mummification to the followers of Summum, and was mummified himself after his death in 2008, making him the world’s first modern mummy. His golden mummiform is currently housed at the Summum pyramid. Summum offers mummification services for pets and humans, and more information on the practice is available on their website. The temple was licensed as a winery in 1980, built with the intention of “producing divine nectars whose recipe pre-dates that of the oldest of wineries…[aka] Nectar of the Gods.” Beyond producing nectars and providing mummification services, the Summum group holds weekly philosophy discussions that are open to visitors, Wednesdays from 7:30-8:30 at the sanctuary: 707 Genesee Avenue, Salt Lake City.